For other uses, see Kestrel (disambiguation). 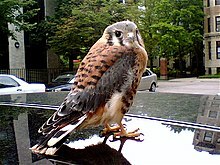 The name kestrel (from French crécerelle, derivative from crécelle, i.e. ratchet) is given to several different members of the falcon genus, Falco. Kestrels are most easily distinguished by their typical hunting behaviour which is to hover at a height of around 10–20 metres (35–65 ft) over open country and swoop down on prey, usually small mammals, lizards or large insects. Other falcons are more adapted to active hunting in flight. In addition, kestrels are notable for usually having mostly brown in their plumage. Kestrels can hover in still air, even indoors in barns. Because they face towards any slight wind when hovering, the common kestrel is called a "windhover" in some areas. Unusual for falcons, plumage often differs between male and female, although as is usual with monogamous raptors the female is slightly larger than the male. This allows a pair to fill different feeding niches over their home range. Kestrels are bold and have adapted well to human encroachment, nesting in buildings and hunting by major roads. Kestrels do not build their own nests, but use nests built by other species. Most species termed kestrels appear to form a distinct clade among the falcons, as suggested by comparison of mtDNA cytochrome b sequence data  and morphology. This seems to have diverged from other Falco around the Miocene–Pliocene boundary (Messinian to Zanclean, or about 7–3.5 mya). The most basal "true" kestrels are three species from Africa and its surroundings which lack a malar stripe, and in one case have—like other falcons but unlike other true kestrels—large areas of grey in their wings. Approximately during the Gelasian (Late Pliocene or Early Pleistocene, around 2.5–2 mya), the main lineage of true kestrels emerged; this contains the species characterized by a malar stripe. This too seems to have evolved in Africa and subsequently spread across the Old World until they reached Australia some time during the Middle Pleistocene, less than one million years ago. This group contains several taxa found on Indian Ocean islands. A group of three predominantly grey species from Africa and Madagascar are usually considered kestrels due to their general shape and habits, but are probably distinct from the true kestrels as outlined above. The American kestrel is the only New World species termed "kestrel". The molecular data of Groombridge as well as morphological peculiarities (like grey wings in males and a black ear-spot) and biogeography, strongly support the view that this species, among the Falco falcons, is not a kestrel at all in the phylogenetic sense but perhaps closer to the hobbies. Other recent DNA analysis takes a similar view that the American kestrel is not a true kestrel, but rather than being linked to the hobbies is more likely genetically more closely related to the larger American falcons such as the aplomado falcon, the peregrine falcon, and prairie falcon. Though the species has not been renamed as a result of these genetic analyses, it is thus likely a descendant of archaic larger falcon ancestors evolved through a process of convergent evolution to fit a similar small prey niche in the ecosystem as the true kestrels. Common kestrels are ultraviolet sensitive which allows them to visually locate the trails of voles. These small rodents lay scent trails of urine and faeces that reflect ultraviolet light, making them visible to the kestrels, particularly in the spring before the scent marks are covered by vegetation. ^ Jefferies, Richard (2011). "The Hovering Of The Kestrel". readbookonline.net. Archived from the original on 17 April 2015. Retrieved 22 April 2015. ^ a b Groombridge, Jim J.; Jones, Carl G.; Bayes, Michelle K.; van Zyl, Anthony J.; Carrillo, José; Nichols, Richard A.; Bruford, Michael W. (2002). "A molecular phylogeny of African kestrels with reference to divergence across the Indian Ocean". Molecular Phylogenetics and Evolution. 25 (2): 267–277. doi:10.1016/S1055-7903(02)00254-3. PMID 12414309. ^ Wink, M., and H. Sauer-Gürth, 2004, "Phylogenetic relationships in diurnal raptors based on nucleotide sequences of mitochondrial and nuclear marker genes", pp. 483-498 in R.D. Chancellor and B.-U. Meyburg (eds. ), Raptors Worldwide, World Working Group on Birds of Prey, Berlin. ^ Griffiths, C., 1999, "Phylogeny of the Falconidae Inferred from Molecular and Morphological Data", The Auk 116(1):116-130. ^ Viitala, Jussi; Korplmäki, Erkki; Palokangas, Pälvl; Koivula, Minna (1995). "Attraction of kestrels to vole scent marks visible in ultraviolet light". Nature. 373 (6513): 425–27. doi:10.1038/373425a0. Wikimedia Commons has media related to Falco.